Modern or contemporary landscapes are growing in popularity as they are perfectly suited to meet the water-wise desires of many Southern California residents. Common aspects include clean lines, strong architectural elements, minimal plants and an emphasis on hardscape such as pavers, concrete and even decorative rock. The overall look should feel clean and organized versus bare and unplanned. Striking the perfect balance may seem complicated but modern gardens actually uses the same elements as any other garden. 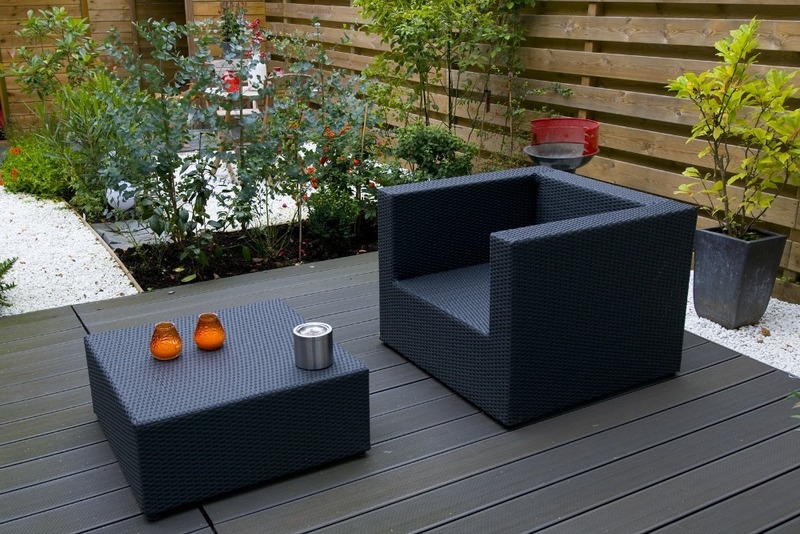 Instead of wicker patio furniture, metal or square chairs with low-profile backs might be used. Palm trees and cactus may replace big, pruned hedges. You get the idea. Here are some of the benefits of choosing a modern landscape design and tips for how to achieve your own. An innovation of mid-century modern design included meshing the interior of the the home with the outside to create harmony between the two. This can be done with color, using the same flooring in both spaces (creating what is called floor flow) and integration of other techniques. Modern garden design lends itself to this look best as very few homes can pull off extending an overflowing English garden style, for example, inside the house. 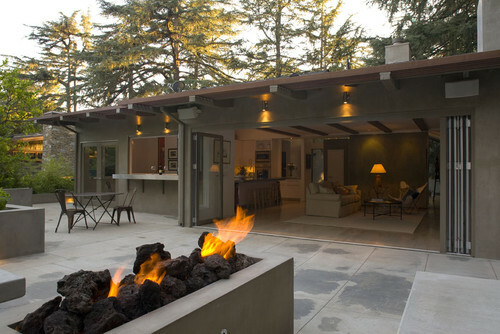 Plus, awesome Southern California weather means that we can entertain al fresco year-round. There’s no better way to expand party space than by creating a smooth transition between the indoors and outdoors that you and your guests can enjoy. The homeowner above probably doesn’t need an irrigation system to water these plants. Only three are shown but each has architectural interest and looks stunning placed in this minimal modern landscape. Again, the mix of hardscape (stuccoed wall, different colored concrete, brown pebbles and blue rock) create enough of a design to appreciate the homeowners intentions. The type of plants used depends on your personal preferences as long as they appear deliberately placed and chosen. Succulents are incredibly popular, especially the large agaves and other rosettes, but native plants and palm trees can work, too. Flax plants and grasses are often used but you’ll notice that most color palates are fairly soft: greens, greys, and blues, primarily. A reason why Japanese zen gardens contain modern design is because the absence of clutter and presence or order has a calming effect on the mind — so much that they’ve been shown to soothe Alzheimer’s patients. The low-maintenance aspect decreases overall stress as one can lounge outside and enjoy the space without spotting excess weeds and other things that fill a to-do list. Those looking for the opportunity to fire their gardener are in luck. It’s very easy to completely omit or replace a lawn in modern garden design because there is such an emphasis on hardscape which also can drastically cut down on water bills. But if it’s hard to imagine giving up the green color, small gem lawns using artificial turf or regular grass can be shaped however you like. Though these grass squares look lovely, they may be a pain to mow and care for. The amount of weeding and pruning you have to do will be drastically cut back, enabling homeowners to actually care for their own gardens easily, should they desire. And, reduced fertilizer and amendment costs equal more money in the bank for other projects. A mid-century modern home might be the perfect fit for modern garden design, but it works for Southwestern style homes and even cottage-style homes (with modifications). 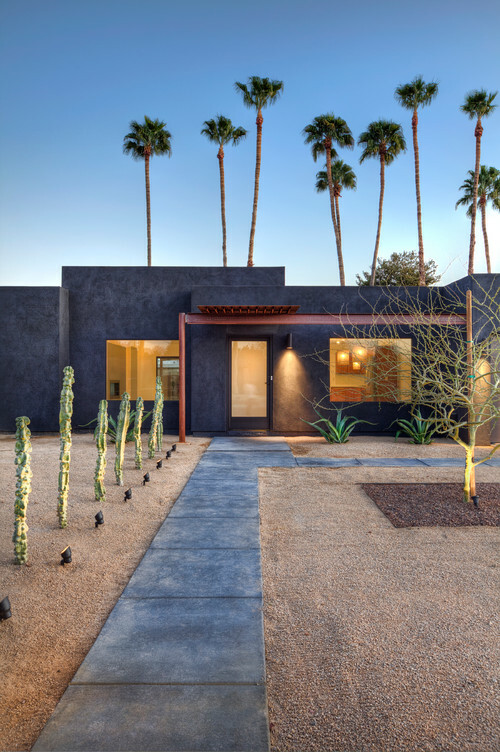 Note the cactus with uplights in the (albeit modern) Southwestern home above. 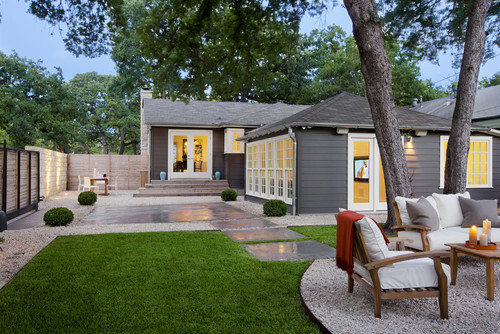 Linking the home’s design to the garden ensure that a minimalist garden isn’t bland or boring. As you can see, lighting also greatly enhances a modern design and is often coordinated in tandem with the plan and not as an after-thought. 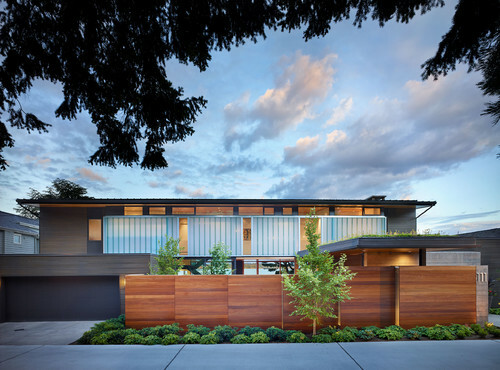 Forget the white picket fence or boring vertical cedar planks. 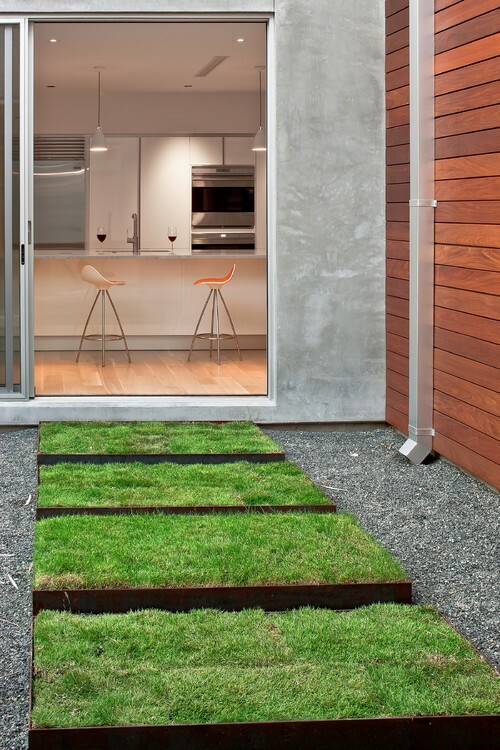 Modern garden design is often accented by unusual fencing as one of the yard’s focal points. 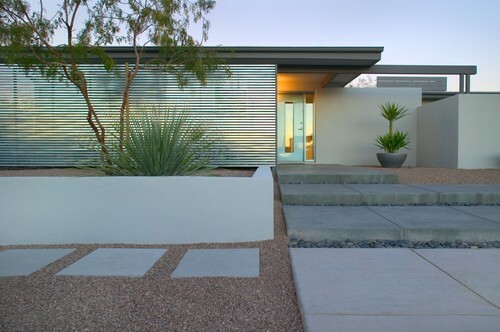 A staggered look here completes this modern front yard. If you go with wood, use horizontal planks and consider using lighting to highlight it after the sun goes down. If you’ve read this far, the usage of mixed materials has probably caught your eye. The way this homeowner below used varying sizes of blue decorative rock along with white rock and concrete is quite stunning. The key is that each material defines a particular space without bleeding over into the next one. Wood shouldn’t be forgotten. With advances in weather-proof decking, rich wood tones help soften the look of a modern yard without too much maintenance. Contemporary water features also add nice ambiance. Sometimes, even clean lines need softening. Sculptures add visual interest to a yard, however, it could be as easy as adding plants that can be pruned into a simple round shape. Contrast the shapes by placing the round accent inside a rectangular or square one. The home above does it twice: once with the round plants and again with the round gravel seating area inside the rectangular lawn. Also note the mixed fencing that adds even more interest to the overall look. 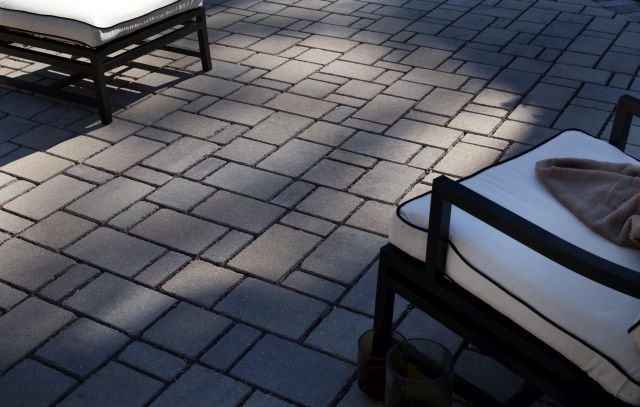 Interlocking pavers can have the modern look by using an alternating linear pattern like this one below. Cover up that hard-to-plant area with decorative rock and hardscape. Add the color you desire by placing a container garden on top of it. Monrovia gardens suggests simple topiaries in linear pots that can include single phormiums (flax), cordylines, agave succulents, palms (Mexican fan palms), blue arrow junipers and fruitless olive trees. 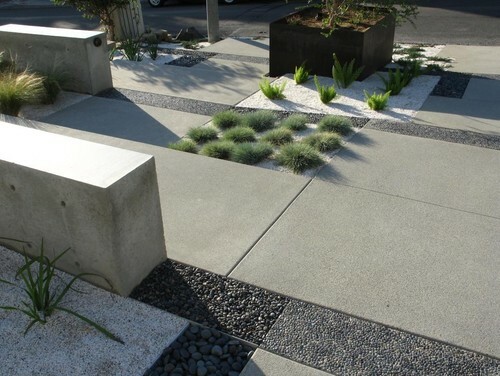 How do you incorporate modern into your landscaping?